Lets be honest, cooking campfire eggs should be super easy! For goodness sake, its just eggs, right? Sadly, I have had more fails learning how to cook some campfire eggs than I have anything else. Often times I make them stick, break the yokes, burn the bottoms or just end up scrambling them inside the skillet. If you are in the same boat as me, then I have good new for you. 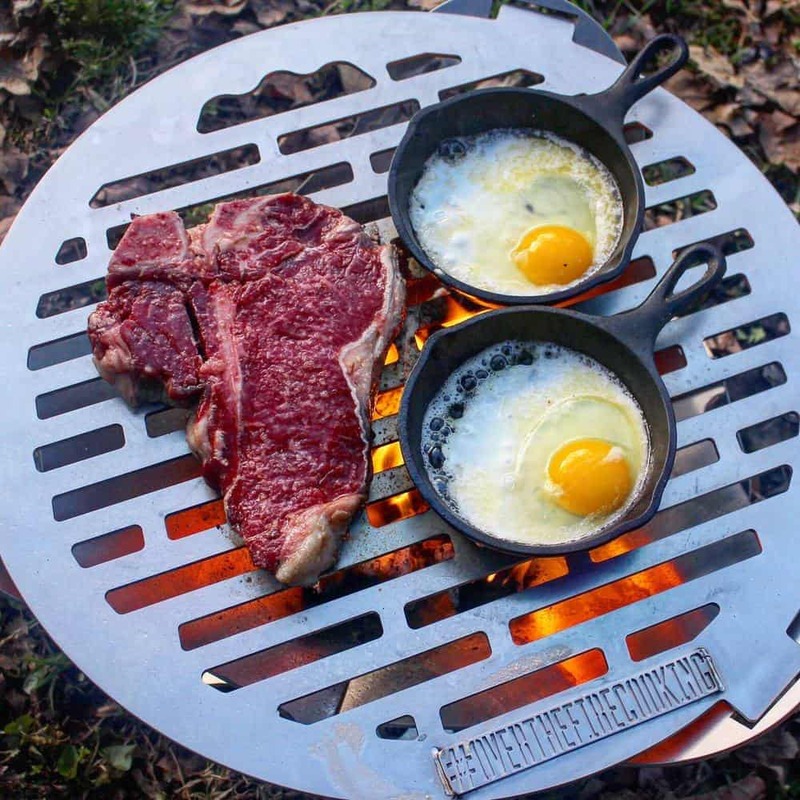 Cooking eggs over a campfire is easy… when you know a few tricks. My 5 tips below will help make sure that you cook perfect eggs every time. Each tip helps you overcome an obstacle that makes cooking eggs tough! So get out that cast iron skillet and ready your fire because we are going to flavortow… I mean eggtown! Butter, butter, butter! This is the lifeblood of making anything good in cast iron over fire. Butter makes sure that your skillet is seasoned so that the eggs do not stick! Make sure to use 1/2 tbsp for every egg that you make. It also helps to have the right skillet to prevent sticking (see below)! Not all cast iron is the same. Well this might be an exaggeration, but the truth is that the more you use a skillet the better it will cook. One thing that I have learned is that a well seasoned skillet makes all the difference! 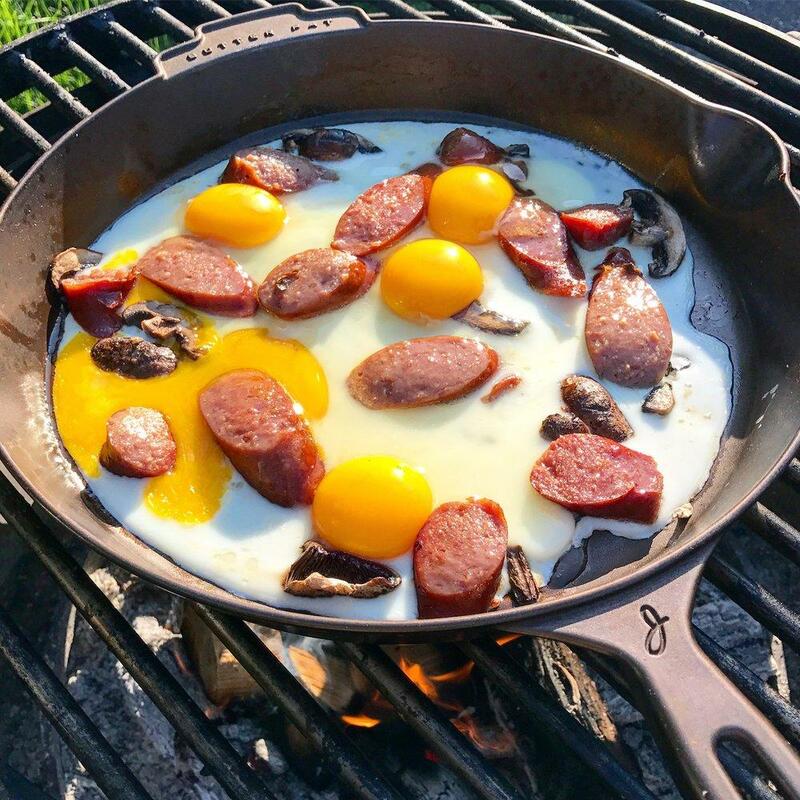 Make sure to get a pre-seasoned skillet for cooking your campfire eggs. Add butter to help prevent sticking as well. Finally, clean the skillet with only water, spray a coating of Canola oil inside, wipe clean and you will start building a seasoning ASAP! Preheating your cast iron will help a lot in making sure that everything cooks evenly. Since cast iron doesn’t actually heat very evenly, then make sure to put it over the fire about 5 minutes before you start cooking. Don’t leave it on for too long though! When the skillet is super hot then the butter will melt quickly & burn. This will cause eggs that are dark brown with a burnt flavoring. Make sure to check the skillet before you add the butter so that it is not scorching hot! Look at that little skillet! The amount of room that the campfire eggs have to cook makes a huge difference! A normal 8″ skillet can comfortably cook 3-4 eggs (preferably 3). When you are cooking, try to use a skillet that makes room for the eggs so that they do not burn from being cooked for too long. 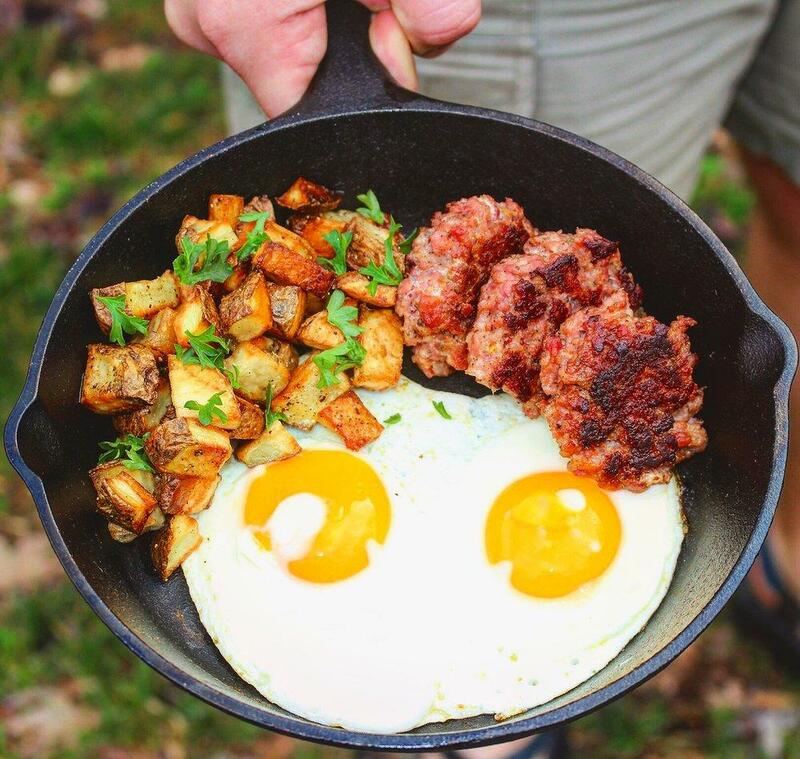 One of my favorite skillets is the mini skillet from Lodge Cast Iron (shown above). These guys cook one egg comfortably with no hassle! So you get clean white eggs! 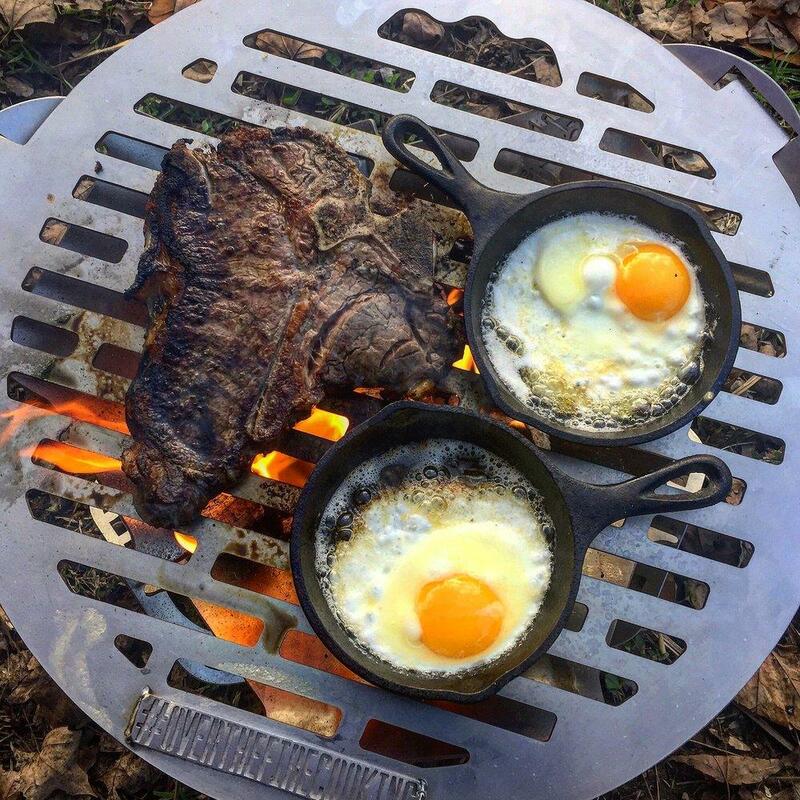 If you are like me, then most of the time campfire eggs are accompanied by meat. 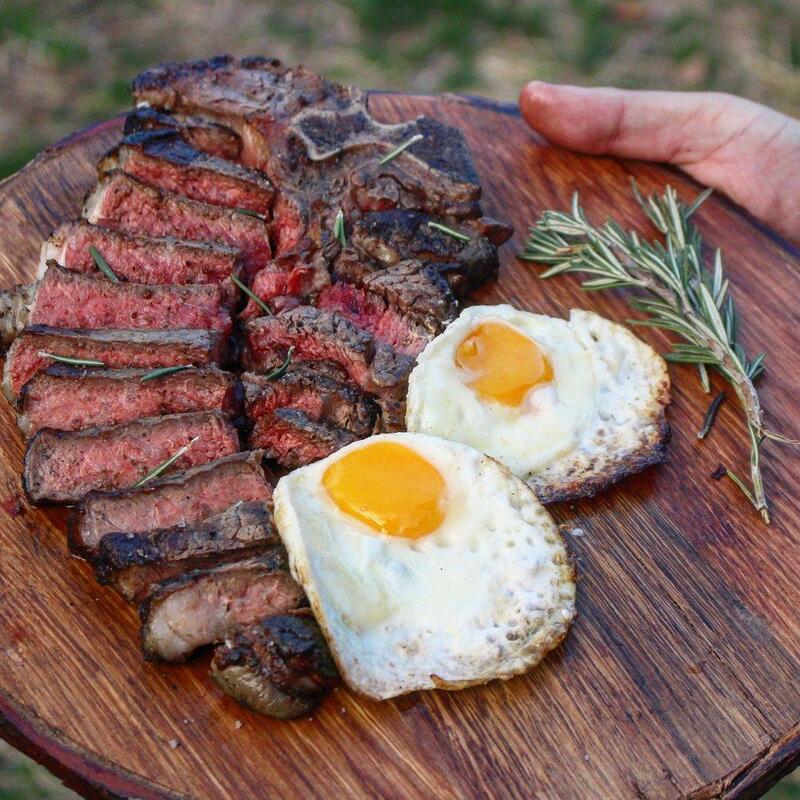 Whether it is bacon, sausage, or steak; make sure to cook the eggs after the meat. This is for two reasons: 1. The eggs will be cold by the time the meat is done cooking & 2. The grease from the meat will add a ton of flavor to the eggs. If you have a lot of grease leftover from the meat (like bacon and sausage), then make sure to wipe the pan a little bit so that the eggs don’t turn black! Trying to Reverse Sear a Steak with Eggs? Cooking eggs over a campfire is super easy. Just takes the right tools, tips and tricks to make it happen. Stop back next week as I will be teaching how to properly season your skillet!